Each year, I attend the Dayton Hamvention and much of the QRP conference, Four Days in May. This year, I’ll be working our Ears To Our World table again, along with other volunteers, at booth 411 in the Ball Arena (BA411). Please stop by and introduce yourself! What I love about the Hamvention is that it is a one-stop-shop for innovations appearing in our radio world. Ten-Tec announced yesterday that it will merge with Alpha Amplifiers under the flag of RF Concepts. I plan to stop by Ten-Tec’s booth Friday and learn more about the merger. Personally, I believe the merger with Alpha Amplifiers is a good move. Both of these companies are known for great customer service and quality US-based design and manufacturing. I know Ten-Tec is introducing a new open-source product to their line, the Patriot, because I’ve been beta testing one (check QRPer.com for details later this week). Icom will showcase their new ID-5100 D-star, dual band, mobile with built-in GPS. While I’m more of an HF guy, this radio does intrigue me. You see, for almost one year now, I’ve been very pleased with my Icom ID-51A, dual-band, D-Star handie talkie (HT). I find D-Star to be a very flexible digital mode and I’m amazed with how many interesting mom-and-pop companies have produced products for the D-Star mode. I’m surprised neither Yaesu nor Kenwood has adopted the D-Star standard (it’s not proprietary to Icom–indeed, read about the CS7000 below). The new ID-5100 is a mobile version of my ID-51a. What I love about this radio is that it can store repeater frequencies and dynamically load them based on your geographic location. Perhaps my largest gripe with mobile VHF/UHF rigs is their inability to adapt to the repeater “landscape” when you travel. The ID-5100 may change this and push other manufacturers in the same direction. In less than a year, Connect Systems has become a household name among ham radio enthusiasts who love VHF/UHF and digital modes. This Connect Systems is developing an HT–the CS7000–which will be the first non-Icom radio to have the D-Star digital mode. 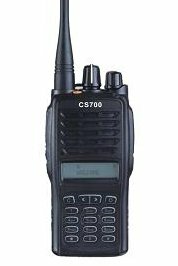 Whatsmore, in addition to D-Star, the CS7000 will also pack DMR. I don’t think Connect Systems will have a working prototype at the Hamvention (I could be wrong), but there is a possibility that they will be taking early orders. I’ve been intrigued by the Elad line of Software Defined Recievers. This year, they will attend the Dayton Hamvention. I look forward to checking out the new FDM-DUO tabletop SDR. I plan to review some of the Elad product line in the near future. Last year, Palstar showcased a prototype QRP transceiver with touch screen interface. To my knowledge, this would be Palstar’s first transceiver (though they’re well known for antenna tuners and their shortwave radio receiver, the R30A). 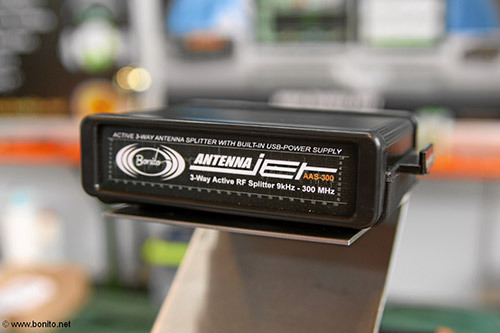 I’ll stop by Bonito’s booth to check out their new AntennaJet ASM300. I’m curious how it works and what the Hamvention price will be. Though pricing is a little steep, I might bring one home as I often would like to share one antenna with two receivers simultaneously. The only new product I know of from Elecraft is the PX3 Panadapter for their Kx3 transceiver. Reviews of the larger P3 Panadapter for the Elecraft K3 are excellent, so I imagine this will be a great product. I hope to check out the PX3 at the Elecraft booth–I believe they’ll have a prototype on display. For the past three years, the market for software defined radios has been growing rapidly. I’ll be on the lookout for anything new–especially improvements on current 3rd generation SDRs. Please comment if there’s something you’d like me to check out at the Hamvention–I’ll try to include it! Again, if you’re attending the Hamvention, please stop by and introduce yourself at our booth: 411 in the Ball Arena (BA411). This entry was posted in Announcements, Articles, Conferences, Events, FDIM, Hamvention, News and tagged Alpha Amplifiers, Bonito, Connect Systems CS7000, Elad, Elad FDM-DUO, Elecraft, Elecraft PX3, Icom, Icom ID-5100, Palstar, RF Concepts, SDR, Ten-Tec. Bookmark the permalink.